Similar to neighborhoods, location is critical. 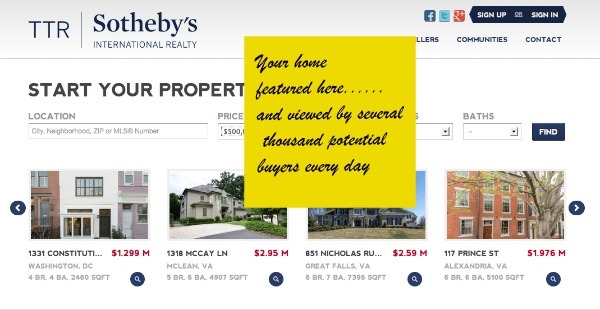 Accordingly, the “location” of your property listing “above the fold” in a headline position on a Web site is critical to visibility and to connecting with qualified buyers. One of our key technology advantages is the ability to attract and further qualify thousands of visitors a day to our premium listings, including yours. Get Featured "Above the Fold"
Our “featured properties” section acts as a digital magnet in attracting ready-to-go buyers who are searching on neighborhoods and demographics similar to your property listing. We make it easy for them to not only view your listing by ensuring it’s in the top search results, but we also allow buyers to easily filter and narrow their search further – accelerating the sales process. We devote significant resources to ensuring our Web site continually places in the top five listings in the major search engines ranging from Google and Bing to Yahoo and other less well known sites. We know all too well that most buyers don’t look any further than the first page, much less the first few listings. Our experts combine Search Engine Optimization (SEO) techniques, such as the creation of relevant neighborhood content and link building to help the search engines in “finding” our site and matching it to relevant search queries. By studying the behavior of thousands of prospective buyers, we’re able to maximize the number that will ultimately contact you. While a solid Search Engine Optimization (SEO) foundation is critical to being “found,” it’s even more critical that prospective buyers have a positive customer experience once on the site. Can they easily find adjacent neighborhoods? Public transportation information? School rankings? The ability to search on different demographics as well as set preferences helps ensure buyers are highly qualified before they set foot in your home. Our interactive maps are particularly helpful for those buyers who are moving from outside the Greater DC area. No real estate selling strategy is complete without a visible and highly sophisticated Web component. Take advantage of our expertise to ensure you get maximum value for your real estate assets.